Of the few big bikes I have ridden I've noticed a pattern - big power comes with its compromises. Motorcycles get heavier and suspension gets stiffer. It was the same case with the two street nakeds we rode a couple of months ago. Both the Street Triple and the Z800 had 100PS plus motors wrapped in sharp and sporty frames. They were hugely exciting and had us pumped up at the end of a very fast day. But once the adrenaline wore off, logic began planting its hateful seeds of doubt. Would I want to live with a scrunched up riding position (even the sport nakeds put your legs up and wrists down) every day of the week? Even so I'm sure I would eventually tire of constantly watching out for potholes and speed breakers because of the taut suspension. Shumi would at this point tell me to quit complaining and enjoy the ride. But I'm a practical sort and I find joy in a machine that can do it all. However, until very recently, such a motorcycle seemed an impossible dream. That changed when I first rode the Suzuki 1000 two months ago. Here was a bike that offered the 100PS ballpark figure and a huge slug of torque that made it very fast indeed. And as I soon discovered, beneath that big and intimidating looking body was a surprisingly light (relatively) motorcycle, lighter still than Kawasaki. And it handled pleasantly well too, eager to lean over all the way till the footpegs kiss the tarmac. But what really had me was the way the Suzuki handled our roads. Good roads, bad roads, no roads, nothing slowed the Strom down. The bike just rolls on, keeping its rider in unexpected comfort and isolation from any nasties in the road. My eyes were opened to the wonder of adventure bikes, particularly to their effectiveness in our conditions. Naturally we wanted to ride more of them, so we decided to start with two of the more affordable examples that you can buy in India. 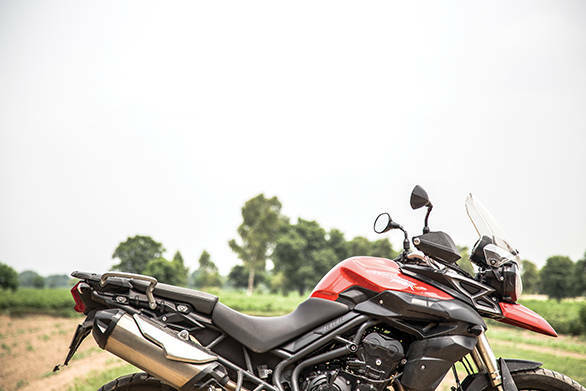 The Triumph Tiger 800 XC is at the most affordable end of the spectrum while the V-Strom, although a good Rs 3.5 lakh more expensive, is the most accessible 'full size' option. 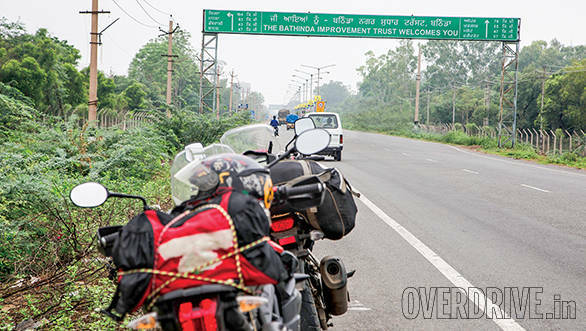 The point of these bikes is that they can take you almost anywhere, so in typical OD fashion we decided to take the path less travelled and go to nowhere in particular. Well, at least nowhere anyone would think of as a holiday destination - the town of Bathinda in Punjab fits the description perfectly. Aside from a couple of old forts and a power plant that overlooks a lake there isn't really much else to do there. But then again, with good motorcycles, it's all about the journey, the destination being a relaxing reward at the end. We were three of us, Makarand, our photographer, Alan and myself. We had no back up car so it was Alan and me riding while Makarand sat pillion. We packed as light as possible, almost all our essentials for three days fit into Vaiterra which sat comfortably and securely on the V Strom. The Tiger with its upswept exhaust and high grab rails wasn't as ideal a mounting point for the Viaterra, so we bungeed a small duffel bag on its luggage rack instead. Surprisingly, Makarand found the Suzuki offered more space despite the fact that it was holding the bigger bag and had the bigger rider. So we set off with Alan and Makarand on the Suzie and me on the Triumph. It was love at first ride. Barely a couple of kilometres in and I was thoroughly taken by the Tiger. And it was all thanks to its gem of an engine. 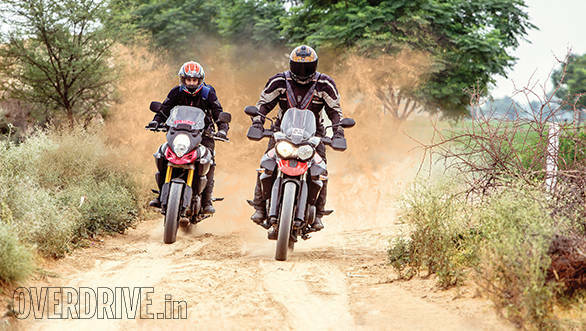 What really appeals about the 800cc inline 3 is that it's sporty but not compromised. The 95PS engine revs hard to 10,000rpm and produces a sweet wail at the top of its rev band while the exhaust tings and pops every time you roll off the throttle. First gear is good for exactly 100kmph which gives it middleweight sportbike performance. But the joy is that the Tiger doesn't have to be consistently ridden like it's hopped up on Redbull and vodka. Once the pace drops, you'll discover a very tractable motor that pulls without complaint from anything above idle. It'll even sit at 40kmph in sixth gear without protest, something the torquey V-Strom is not so happy doing. Sure, it doesn't have the same mid range wallop, but in terms of pure flexibility, the Triumph has the more capable motor. After a couple of hours, switching to the V-Strom was a whole different feel. Clamber aboard (both these bikes are tall machines) and you're greeted by a slightly more compact feeling cockpit. Strange as that may sound considering the Strom is actually the larger and heavier, it's all down to the ergonomics. 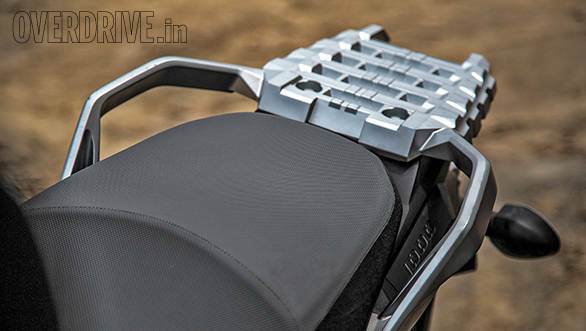 While both bikes seat the rider fairly upright, the Tiger comes with a wider handlebar and slightly rear set footpegs. It's a slightly sportier and more off-road friendly riding position but it does make the bike seem a bit larger. 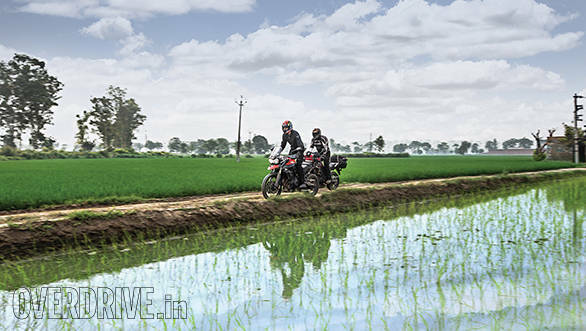 The V-Strom's friendly nature continues as you ride, the bike feels stable and light to steer which belies its 228kg wet weight, some 13kg heavier than the Triumph. But if there's ever a motorcycle built for spending long hours on the open road, it's the V-Strom. The 1037cc V-twin produces 101PS and a strong 103Nm of torque at 4,000rpm. It's this torque spread that defines the riding experience. The twin which feels a little vibey at idle smooths out quickly and propels you down the road in an effortless and remarkably silent fashion. The V-Strom's punchy midrange and low noise levels make it a great stress free companion when you're looking at clocking hundreds of kilometres at a stretch. 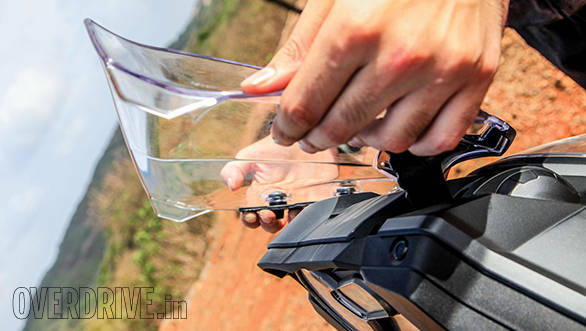 The only mild irritant was that the V-Strom's windscreen seemed to generate a lot of buffetting around the head. Alan who's shorter and has a more aerodynamically efficient engine, didn't find it as big of a problem but agrees that it definitely exists. None of the nine adjustable positions in the windscreen seemed to make things better for me and I prefered the fixed screen on the Triumph. Two twists of the very convenient remote adjuster added some preload to the V-Strom's rear suspension and the bike never touched down again. Fortunately the added preload didn't compromise the fantastic ride either and the V-Strom still continued to be the more supple of the two although I was very comfy on the Triumph as well. Where the Suzuki did have a clear advantage was in the braking department. 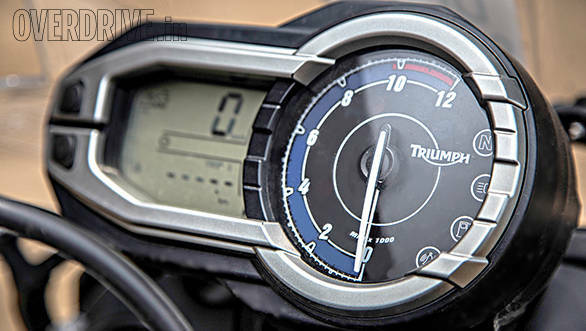 The Triumph's brakes are perfectly up to the job but require a strong pull of the lever. The Suzuki's however feel like they've been lifted clean off a sportsbike and pack big power with a progressive feel. Everytime we swapped bikes, the rider moving to the Suzuki ended up braking more than he planned to the first time and then immediately appreciating the superior stoppers on the Strom. 400km may not seem huge but the journey took us nine hours thanks to plenty of stops for photographs. We also had to pull over to make sure the camera equipment stayed safe when the clouds opened with a vengeance. But it was the final stretch after Sirsa with perfect tarmac and a beautiful canopy of trees that will be etched in my memory. It was a fast, exhilarating ride with the trees echoing the Triumph's angry scream as we powered through. The Strom, although more silent, was effortlessly keeping up, Alan clearly having a good time while Makarand's grin said he was enjoying the ride as much as a pillion possibly can. 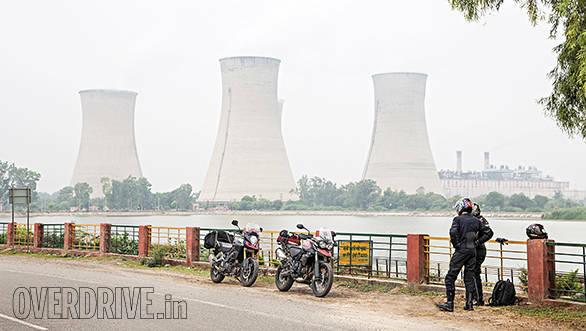 Finally, at six in the evening we entered Bathinda city where we faced a three kilometre ride in pretty slow and heavy traffic. And that's where we saw a completely different side to the bikes. Again, both had their plus and minus points. The Suzuki needs more shifts and that begins to bother you after a while because the clutch isn't very light and the lever extends quite far out, even on its closest setting. The Triumph on the other hand was happy pottering around in third, even fourth gear without complaint and the clutch was definitely lighter than the Suzuki's. The problem with the Brit was that after about ten minutes in slow moving traffic it gets rather hot and your left thigh will feel like a rotisserie chicken on a slow flame. It's only a sensation however and the bike's temperature gauge sits comfortably below maximum. Granted, this is pretty common with most big bikes but the only reason we bring it up is because the Suzuki runs amazingly cool, no matter what the condition. The litre engine produces just 100PS so it's quite unstressed, but either way Suzuki has done a very impressive job with heat management. That evening, over a couple of cold ones, we discussed what we liked with each bike. Both Alan and I had a slight bias for each bike and that's because we both look for different things in a bike. Alan likes a slower motor with a lot of thump which is why he naturally gravitates towards twins (not the human kind, he insists). I, on the other hand, love a smooth engine - I don't want to feel an engine between my legs so much as I want smoothness, a sweet noise and the ability to rev it out. And in that respect, the Triumph is right up my street. 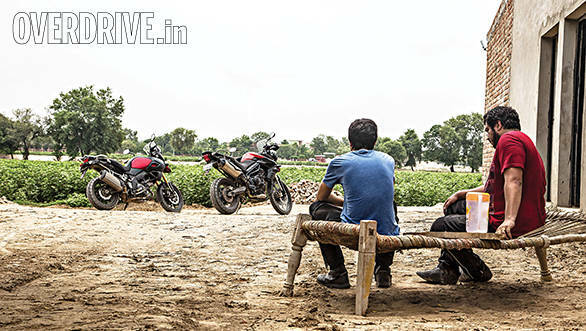 However both Alan and Makarand seemed to prefer the Triumph's seats and found the Suzuki's slightly soft over a day of riding. I honestly found both pretty comfortable but that could be just because I don't happen to weigh a lot. 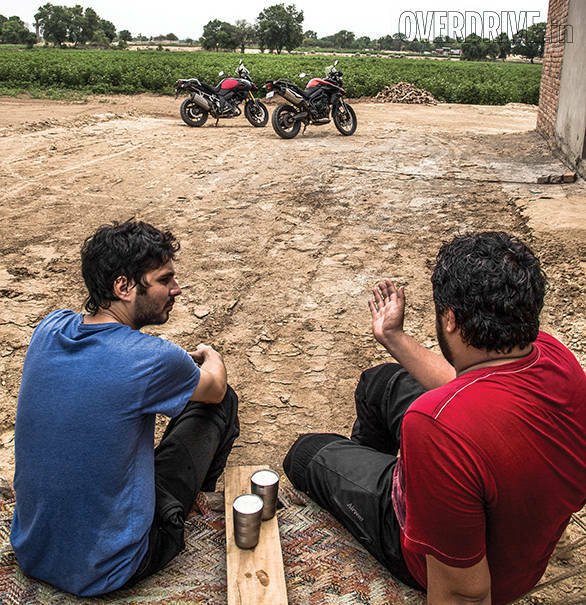 The next day was spent shooting in and around Bathinda. 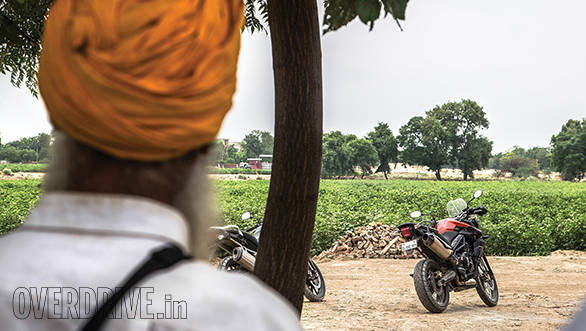 Punjab has fields everywhere and most farmers were happy to let us tear it up on the mud roads that connect their crops in exchange for a look at the bikes. So far, the Suzuki was the easier and more capable motorcycle on the road. But now we were in the Triumph's territory. 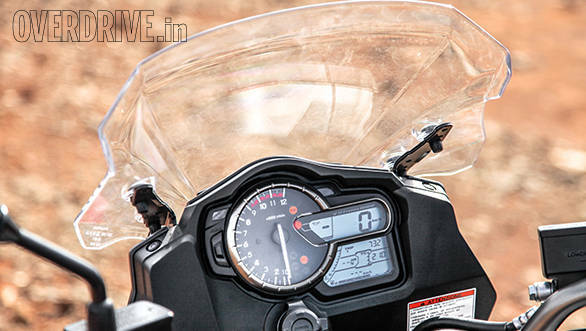 The Tiger is teeming with features that hint at its off-road eagerness. The wide handlebars, the huge 21-inch front wheel wrapped in skinny 90 section rubber, the standard brush guards, the engine bash guard - they all make sense when you take the Triumph off the beaten path onto a beaten path. These muddy mid field paths are covered in a thick layer of fine dust. 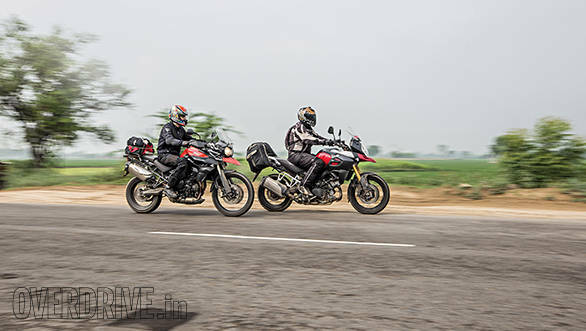 The V-Strom, with its fatter 110 section front tyre found itself weaving around uncomfortably while the Triumph sticks steadfastly to the line the rider chooses. There's no doubt that the Suzuki can easily handle such situations - it's just that the Triumph feels more at home here. 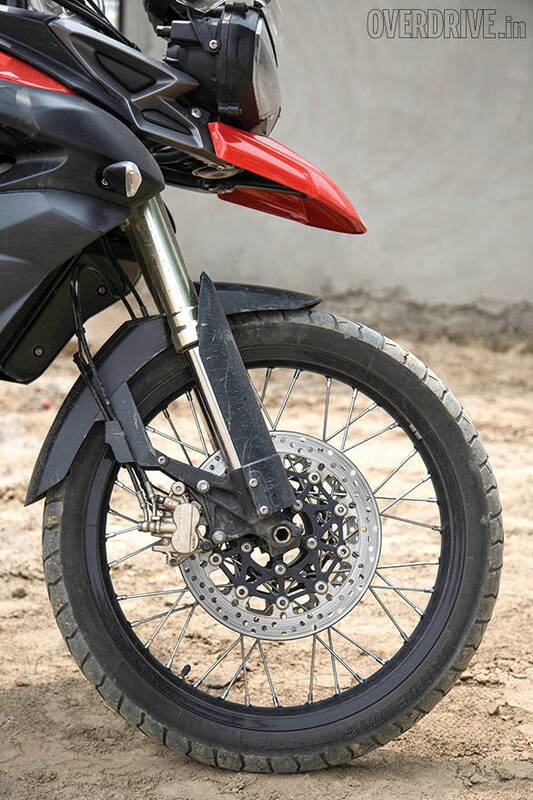 The Tiger's brakes feel easier to use here too and the extra ground clearance is a huge help. 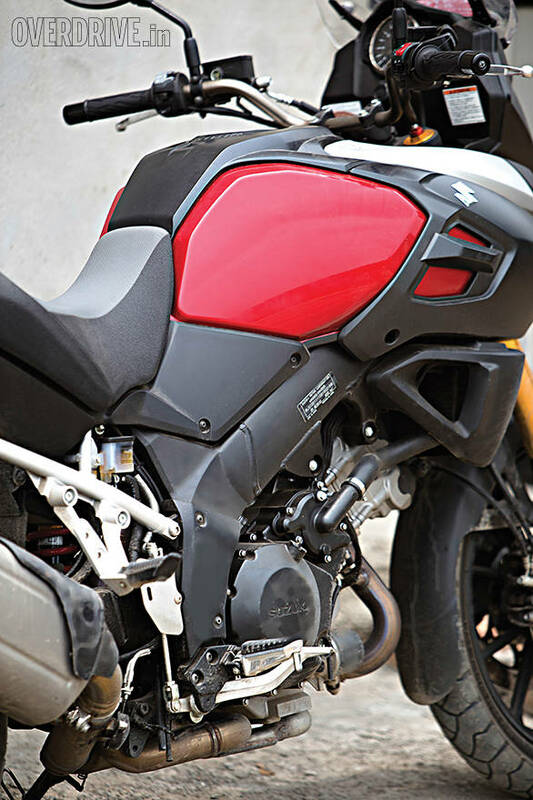 Both bikes come with ABS, however, the V-Strom benefits from its three stage traction control system. But then the Triumph with its smooth throttle and manageable power never felt like it needed the electronic aid. 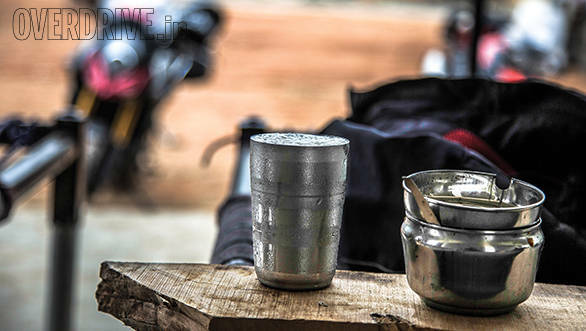 By the end of the day, it was clear which bike we'd chose if a trip to Ladakh was on the cards. Four tiring but exciting days later we were thoroughly sold on both bikes - they really are the smartest kind of big machines available in India today. The Triumph may seem a steal at about Rs 13.7 lakh but its actually the Suzuki that is the better deal. For the extra money you get high spec fully adjustable suspension, traction control, a slipper clutch and slightly better build quality, in general. But choosing between these bikes is a matter of introspection into what you want from a motorcycle. I personally have huge respect for Alan's pick, the Suzuki but my heart yearns for the Triumph. Even so, the Triumph isn't perfect in my book - it's a little too 'off-roady' for me. I'd rather have one with a smaller front wheel and a narrower bar. Triumph actually has such a bike on sale abroad in the standard Tiger 800 (we only get the XC in India). It's actually cheaper than the XC too. Our friends at the Delhi dealership tell us the Tiger 800 XC is one of their fastest moving motorcycles. Maybe that could prompt Triumph to bring the standard 800 down at some point and possibly even locally assemble it. That would result in a more realistic price, hopefully around the Rs 10 lakh mark. What a fantastic bike that would be.